Traventuria Ltd. - Adventure, Nature & Culture Tours In Bulgaria. The Balkan Mountains on a horseback. Scheduled departures. Our best-selling hiking group tour! Scheduled departure dates. 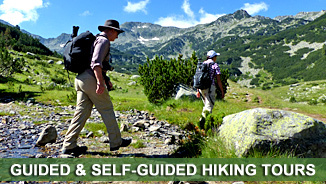 Explore the Rhodopes with our best-selling self-guided walking trek! SCHEDULED DEPARTURE DATES! Enjoy Bulgaria’s most picturesque alpine treks, climbing the Balkans’ tallest summits: Musala (2925m) in the Rila and Vihren (2914m) in the Pirin. Cheap every-day tours from Sofia to Rila Monastery and Boyana Church (2 UNESCO sites) from 30 Euros/person, incl. English-speaking live guide (audio guides in other languages). SCHEDULED DEPARTURE DATES! A well balanced program with half-day (or shorter) easy to moderate walks, offering more opportunities to visit also culture sites. SCHEDULED DEPARTURE DATES! Revel in the beauty of nature amid winter. Sense the calm of winter magic in three of Bulgaria’s best-loved mountains. A memorable transit through some of the least-known and most authentic parts of the Rhodopes: Bulgaria’s most lyrical mountain famed as birthplace of the legendary musician Orpheus. SCHEDULED DEPARTURE DATES! Our best selling horse back riding trek. This tour is following the ancient trails that for hundreds of years have connected the North of Bulgaria with its Southern parts. TRAVENTURIA LTD. specializes in offering tailor-made solutions and aims to deliver value for money products by combining professional approach with in-depth local knowledge and flexibility. The main operations include fully catered culture and active tours in Bulgaria (incl. guided and self-guided walking holidays, birdwatching, horseback riding), ski & snowboard, congress and teambuilding events, airport transfers etc. TRAVENTURIA is the only adventure company in Bulgaria, receiving Certificates of Excellence by TripAdvisor every year since 2012!